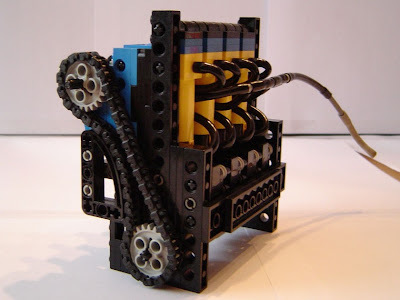 Maybe you remember an old TBs post here, where the Alex Zorko (nicjasno.com) LEGO Pneumatic Engine (LPE) 'Inline 4', was mentioned and shown. For those interested to try it, see the 'Inline 4' instructions and also the instructions for two other Double Cam (SOHC) V8 LPE versions below. 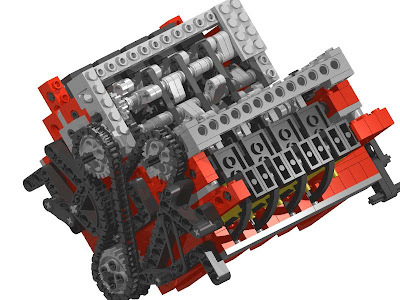 Download here the instructions for the 1220 rpm 'Inline 4' motor, which Alex stretched up to an incredible 1420 rpms on his 4 cylinder studless version. I wonder how many PSIs, did he used to feed the motor while running at these speeds. For the 'Charger V8' version, find the instructions in photos here and ldraw images here. This motor ran at 700 rpms. 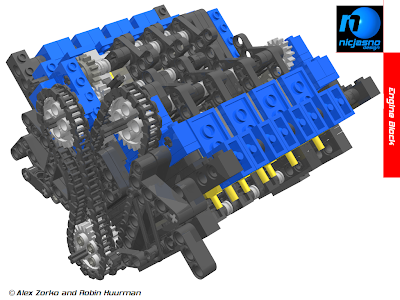 The instructions for 'Mustang V8' version can be found here. This one ran at 960 rpms. is the guide on the chains the same on 'Charger V8' version and the 'Mustang V8?